THE she-oaks are in flower. If you have Casuarinas, or she-oaks, near you, you're probably seeing the russet tips of the male of the species, but the female is the one to keep your eyes peeled for. The flowers are tiny but the deep magenta flares against the autumn bush landscape. Seeing one in flower a week ago was among the highlights of my month and a symbol of the slower pace and deliberate thought I planned for myself over the past weeks. Holiday leave at the start of May was a kind of pre-winter hibernation - a time to mentally take stock, look after my body and move away from routines that felt old and tired, and more importantly made me feel older than my years and more tired than I'd ever been, even when there were children at home. 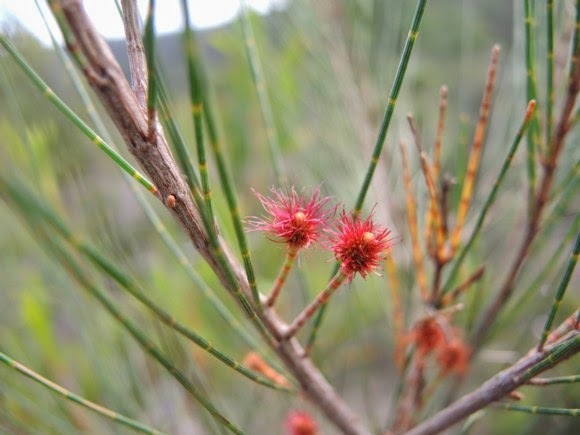 All in all, it's been a wonderful few weeks and while there's a lot to take in below, if you go no further than here, just stop for a moment, go back to the top of this post and marvel at those tiny, short-lived flowers of the female Casuarina. I READ: The Walking Book Club's inaugural book choice, Life After Life, by Kate Atkinson. I have listened to a great many audio books but this was the first that had me beat. It's a great read and I was so engrossed that I was plugging the head phones in not only while walking but while completing domestic chores or chugging home from work on the train. It's just that because the timeline jumps around it's not as easy to whip back a couple of chapters and match up a storyline. A page turner, for sure, but as an audio book, not so much. My workplace has also launched a social book club and the first book off the shelf is The Uncommon Reader, by Alan Bennett. I have the last five pages to go. I know, the last five, but I was interrupted in finishing what is really a one, or two-sitting read, by a little voice calling out from her mid day sleep. What's one to do. I WENT TO... A night of dangerous glamour and wicked indulgence at Sydney's Justice and Police Museum. You can see photos from the night here, and a photo of me and my crazy girlfriends here (I am second from the left). I also went to the Sydney Writer's Festival launch of Tara Moss' new book, and first non-fiction work, The Fictional Woman and, just this week, enjoyed an after-work dinner with my sister, down from Brisbane, watching the lights of VIVID from Opera Kitchen. Yet, despite a wholly awesome month of rest, work and play, the best thing I did was get outside. A day of crossing mountain ridges in Dharug National Park and another scrambling about in undergrowth hunting for fungi to photograph were, hands down, the best things I did in May. I LISTENED TO... Aside from an audio book, my own thoughts. Two weeks to do absolutely nothing but that. I wanted time to unplug and drift. Drift with my days, my thoughts and listen, really listen to what my body and mind needed. Perfect. I ATE... Two weeks off might have helped rejuvenate the mind, but it did my waistline no favour. I did exercise more than I can usually manage in any given work week, but any benefit was lost in regular jaunts to Oomph for a coffee and the cafe's ridiculously good caramel slice. Oomph's haloumi slider is also well worth a lunch date if you find yourself in my neck of the wood. I SAW... Two weeks at home with nothing to do and really nowhere to go meant I could slide onto the couch and stay there for hours watching DVD after DVD. Mind you, it was nothing too taxing. I didn't want grit, or violence or Avant-garde, I was perfectly happy with series one and two of Land Girls. I MADE... A Bertie Beetle (thank you to all that said it did indeed look beetle-esque) and finished the knitted Point of View vest. I started on knitted socks and last week turned my first ever heel. Don't go congratulating me just yet, I stuffed up the rounds shortly after and have been putting off trying to fix it. You may, or may not, see a finished pair of socks listed here next month. Have a wonderful June. May your turned heels give you no grief. Your month sounds full of interesting things and restful time Katie! Your fungi photography outing sounds like a lot of fun. Happy Sunday to you.